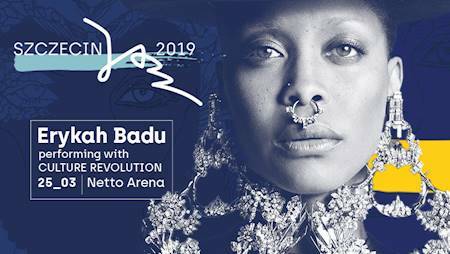 You will not measure her by any means and you will not assign her to any category, but you will meet her in Szczecin - Her Highness Erykah Badu. On March 25 at 8.00 p.m. in the Netto Arena she will give an exclusive concert as part of Szczecin Jazz festival. It is hard to resist the impression that it will be an extremely interesting musical event of the year. She arrives at the invitation of the Polish saxophonist and producer Sylwester Ostrowski and Keyon Harrold the American trumpeter, the winner of the Grammy Award, to give the one and only show together with their team Culture Revolution. 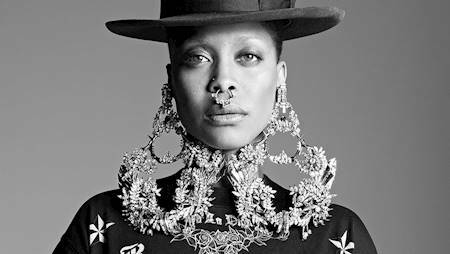 Erykah Badu, her real name is Erica Wright, comes from Dallas, Texas. The versatile singer, producer, activist and, as she calls herself, first and foremost she is mother, is a sought-after, concerting artist whose huge publicity was brought by the first albumBaduizm. The disc has been certified five times platinum, sold over three million copies, won two Grammy Awards and made Erykah Badu a world star. The artist is the author of such hits as Love Of My Life, On & On and Next Lifetime. She has 6 solo albums, many prestigious awards and distinctions. She is also a valued actress. She has appeared in the films Blues Brothers 2000, The Cider House Rules and House of D. She also does well in bussines, leading the record company Control FreaQ Records, which helps young artists to develop their careers, and theBlack Forest Theater (Dallas, USA), where they organize music and charity events. She has successfully collaborated with many great artists, such as Macy Grey, Chaka Khan, Outcast, The Roots, D'Angelo, Common, Guru, Mos Def, and Jill Scott. And for several years, she has been collaborating with artists associated with Culture Revolution, trumpeter Keyon Harrold and rapper Pharoahe Monchem. Culture Revolution is a project developed by Szczecin saxophonist Sylwester Ostrowski and the American trumpeter Keyon Harrold. The artists have been friends for over a dozen years and met in Szczecin, on the occasion of the legendary competition for jazzmen Jazz Struggle. After many years of their friendship, the musicians decided to set up a joint band to give concerts at the most prestigious events in Poland, such as the Musical Fair Co Jest Grane 24, Szczecin Jazz, Jazz nad Odrą, or perform in the most famous jazz club in the worldBlue Note Jazz Club NY, USA . They also released their joint album Culture Revolution vol.1 - When You Are Here, in the recording of which took part the American rap legend Pharoahe Monch, excellent vocalist Jermaine Holmes and Polish Soul star Paulina Przybysz.